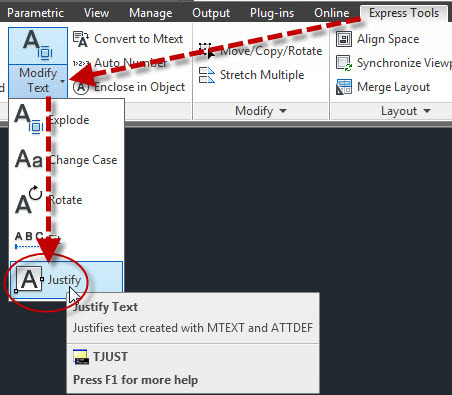 The default functionality of changing the justification of text through the Properties Palette or by changing the properties in the “Edit Text” contextual ribbon will in fact change the justification. But it will also re-position the text based on the new justification point. This might be okay for some instances but if you need to retain the position and change the justification, there is an Express Tool just for this purpose. The TJUST tool is located in the Express Tools. The picture below shows the normal Text Justification repositioning that happens by changing its properties. The picture shown below shows how the Express Tool TJUST will change the justification and keep the position of the text. This entry was posted in Express Tools, Modifying, Text, TIPS. Bookmark the permalink.